Shrinking your new clothes might not be the first thing that occurs to us, even when we need to tighten it a tad bit. But at some point in our lives, we end up with a shirt or a top that is has a more extended hemline, pulled sleeves or just a little bit too huge. And, sometimes it can be a bit tricky to explain exactly what you want to your tailor. That’s when this hack comes in handy. But I know what you are thinking! Shrinking cotton is a lot easier than other fabrics like denim, polyester or even silk! Hey, chill, we have some hacks up our sleeve. Let’s dig in to find out how to shrink clothes in different ways. Put in the garment you are trying to shrink, and turn off the heat. Use a wooden spoon to ensure the garment is entirely immersed. Leave the garment in for about 5-7 minutes, depending on the material. Let it cool off before you take it out and wring it out to check how much it shrank. Put it in a dryer or hang it to dry on a clothesline. Cotton – Cotton shrinks easily and also sometimes bleeds color when compared to other fabrics. So, make sure that you keep them separately, especially if you have whites in there. Polyester – Shrinking polyester is relatively tricky because it does not shrink quickly like cotton. However, the procedure remains the same. You just might have to repeat this process a few times because these take a while to shrink. 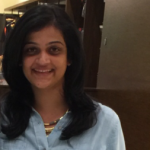 Denim – Denims take much longer than cotton to shrink. So, roll your jeans, denim jacket, etc. and throw them into the pot of boiling water. Let the garment boil in there for 20-30 minutes before you turn off the heat. Let them cool off, wring them, and then hang them to dry. Silk – Silk is protein fiber and shrinks the minute it is exposed to higher heat in any form, which means it takes lesser time for it to contract. 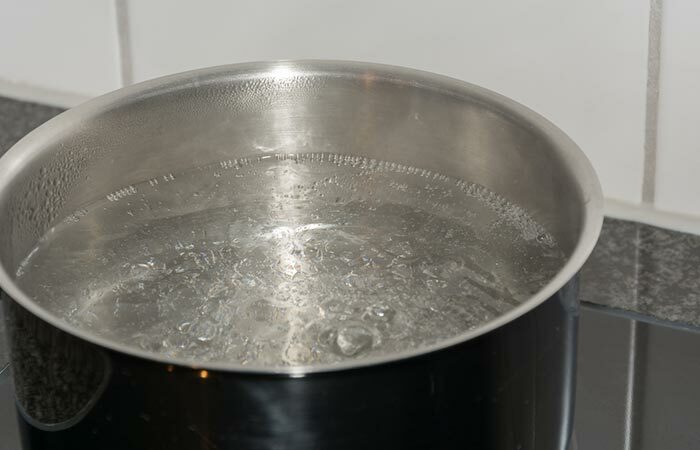 Place the garment in boiling water, and turn off the heat immediately. Let it cool off before you hang it dry. Throw in the garments that you want to shrink in the washer. Put it in the hot water setting. Set the program for the longest cycle. Take them out and put them in the dryer. Select the highest heat setting for the dryer too. Silk – Silk fabrics shrink easily and lose the shine if they are constantly exposed to high heat. So, always use a mesh and run them in moderate heat setting while washing. They can shrink quickly, so use delicate heat setting while drying too. Avoid using chlorine or bleach-based detergents while washing silk garments because they take away the sheen. Denim – Denim can take high heat, so you can use the highest setting. Even better if your washer has a denim setting. You might have to repeat it for a couple of times to see visible results. Polyester – Polyester garments also can be set to highest temperatures, but be doubly sure about the quality of the fabric first because high heat can make them look worn out pretty quickly. Cotton – If it is a delicate piece of clothing you are trying to shrink, go with a lesser setting first and then repeat if required. Take them out, wring them, and hang them to dry. 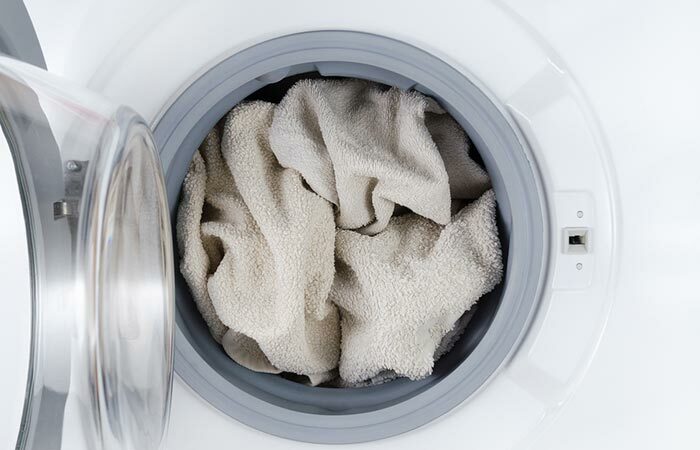 You don’t need a dryer for shrinking clothes as long as you wash them in high temperatures. Cotton – Avoid putting colored cotton clothes in direct sunlight, but hang them where there are enough sunshine and heat. You won’t have this issue for whites. Polyester – Polyester is the easiest to maintain, and wash too. Just let it air dry on a clothing line and you are sorted. Repeat the procedure if need be. Denim – Since you are not going to use a dryer, run the washer at the highest heat setting. Silk – It is best for you to avoid drying silk garments in a dryer. So, take it out of the washer and avoid squeezing it too much. Let any excess water drip naturally. Put it on a hanger and let it air dry. Take them out, and wring them to remove any excess water. Sometimes, you might have a time crunch or the weather might not be favorable. Don’t worry, we have a workaround for that too. 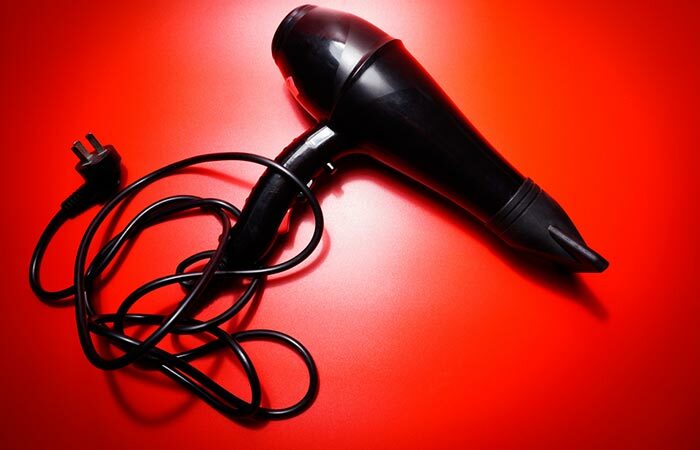 Take out your hair dryer, and put it on the highest possible heat setting. Spread the garment on a flat surface or an ironing board. Focus on one part at a time and let it dry out. This is slightly more time consuming than the other methods, but effective because of the hot air from the dryer. Cotton – Cotton, linen, and other delicates are the easiest to shrink and the fastest with a hair dryer. Polyester – Just do not put the dryer too close to the garment to avoid static. Denim – Denim takes much longer than your regular garments, but it’s your best bet. Silk – Silk shrinks and reacts faster to heat, so like we discussed, it’s best to air dry your silk garments. If you are looking for a fun, short, and an effective weekend project, you just found one. It’s fulfilling to do something so easy yet productive, plus you will have a fitted piece of clothing. Try it out and let us know how it worked out for you by dropping in a text in the comments section below. Why do clothes shrink and stretch? Heat is the primary cause of our clothes shrinking. Throwing in everything inside the washer and washing with hot water, and then putting them all into the dryer with a high heat setting can sometimes not just shrink your clothes considerably, but also ruin them. Delicates, whites, linens, and cotton are not meant for the dryer unless you want to shrink them specifically. It’s always best to air dry them if you have a choice or run them in the lowest heat setting. How to shrink clothes without them losing color? Add salt to the water while washing clothes, the salt helps to lock the dye in. 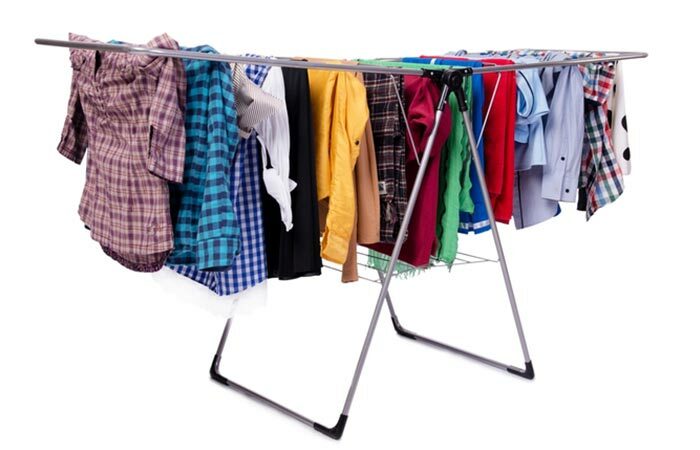 Air dry the clothes in the shade because exposing them to the sunlight can cause the colors to fade. Use color protecting detergents while washing them. How to stretch shrunken clothes? Fill up a bucket with lukewarm water. Add fabric conditioner to it and soak the clothes for about 30 minutes. Rinse off using regular water and hang them to dry. Needless to say, avoid the dryer.